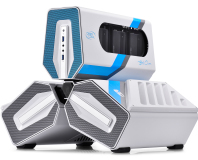 Deepcool has announced a new variant of its eye-catching Tristellar mini-ITX case, the Tristellar SW, featuring a windowed section to show off your graphics card. First unveiled at the Consumer Electronics Show (CES) earlier this year, the Tristellar is certainly one of Deepcool's most intriguing designs. Eschewing the traditional box-like shape of a PC chassis, the Tristellar features three independent sections splayed out in a triangular array: one to hold a mini-ITX motherboard, one to house a PCI Express graphics card connected via extension cable, and a third to host a standard 180mm-long power supply unit and slot-loading optical drive. 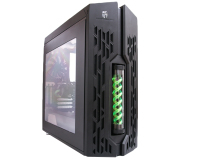 While the original Tristellar was entirely enclosed, the new Tristellar SW is designed to showcase your hardware: the upper compartment includes toughened-glass panels on the sides and top to provide a full view of the graphics card. The remaining two modules remain closed from view in their 2mm SPCC. 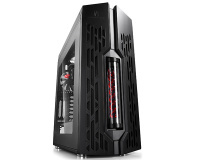 Aside from the replacement panels, the specifications of the case remain unchanged: there's support for CPU coolers up to 85mm in height, graphics cards up to 320mm in length, an optional 120mm fan or liquid-cooling radiator in the motherboard cabin along with the bundled 90mm fan in the graphics card compartment, and support for 2 3.5" and 3 2.5" hard drives. The case measures 388mm in height, 435mm in width, and 395mm in depth, and weighs an impressive 16Kg. Deepcool has integrated a 360mm liquid cooling system into a case along with a funky reservoir.